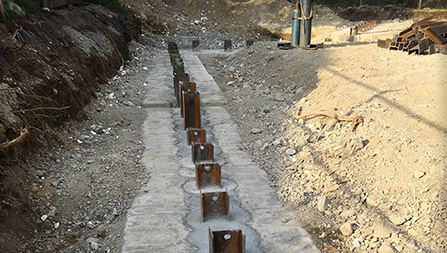 Secant pile walls are formed by constructing interlocked concrete piles reinforced with either steel rebar or steel beams. Used extensively in dense population areas due to the minimal disturbance they cause to adjacent structures, secant walls are a form of top down construction used for environmental remediation and soil retention. 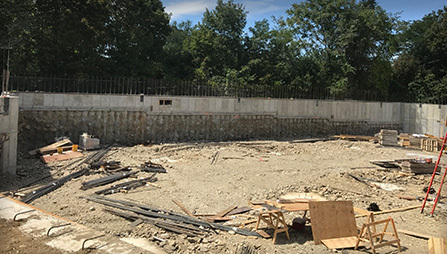 The ABI Mobilram with Dual Auger Casing Drive is often used for constructing secant walls when the wall will be part of a load bearing structure, ground conditions need casing to prevent collapsing of the hole, or I-beams need to be installed without vibration. The double head system improves productivity because the casing and auger go in with one pass and the hollow auger allows the concrete to be injected as the auger is withdrawn. The steel reinforcement is then dropped or vibrated in. The design of the head allows the piles to be right on the border or walls of the adjacent property, maximizing the usable area for development. This feature is especially useful in inner cities with high property prices and a great desire for underground parking space. Secant walls are straight and have a smooth finish with no gaps so they can be used as underground walls in parking structures. In the Double Head Drill, less torque is required to turn the casing because the auger is removing the spoils inside, thereby removing the friction on the ID of the casing. 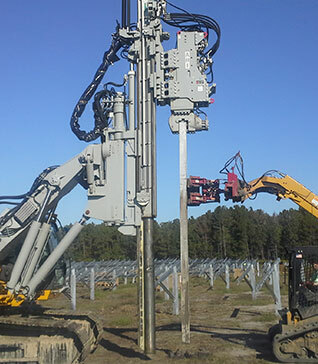 It drills straighter holes as the casing goes in the opposite direction of the auger and therefore does not deviate in front of obstacles as much. Counter rotation brings the spoils out of the ground and keeps the casing clean. The auger head can be adjusted to be inside the (so as not to disturb the ground) or in front of the casing (for hard ground conditions).